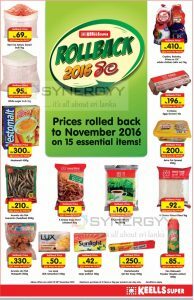 Keells Super brought to Rollback 2016 mila as bring back the November 2016 prices for 15 essentital items in November 2017. 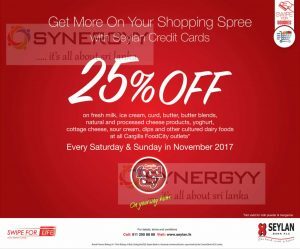 All Above offers are valid till 30th November 2017. And Maximum purchase of 5 items or 5kg per product, per day only. 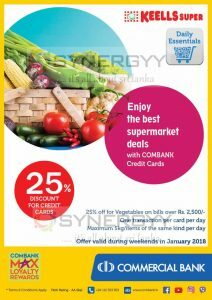 Commercial Bank announces a special promotion of discount upto 25% for fresh vegetables with single transection bills over Rs. 2,500/- on weekend in November 2017. 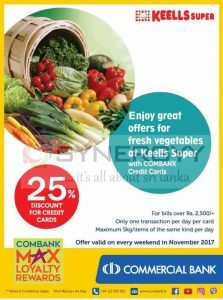 The offer is valid for only one transaction per day per card and maximum 5kg/items of the same kind per day. For more detail see below image or contact to Commercial Bank on 0112 353 353 or visit your nearest keels super.